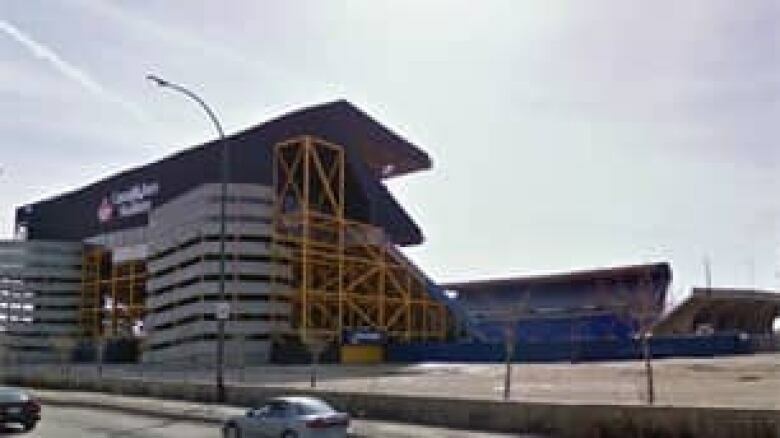 The Winnipeg Blue Bombers will be playing in a new stadium in 2012 after the Manitoba government helped fast-track construction with a $90-million bridge financing loan. The Winnipeg Blue Bombers will be playing in a new stadium in 2012 and host the Grey Cup within five years of that opening date. The provincial government is contributing $90-million in bridge financing to fast-track construction of a $137.5-million development on the University of Manitoba campus. The project includes a $115-million football stadium, while $22.5 million will be spent on fitness facilities for amateur athletics. Manitoba Premier Greg Selinger announced the financing arrangement at a press conference Wednesday morning at Canad Inns Stadium, the Bombers' present home on Maroons Road in the city's Polo Park area. "This will be a first-class facility," Selinger said, noting shovels will be in the ground this summer. "This plan provides the foundation that is needed to move this project forward. 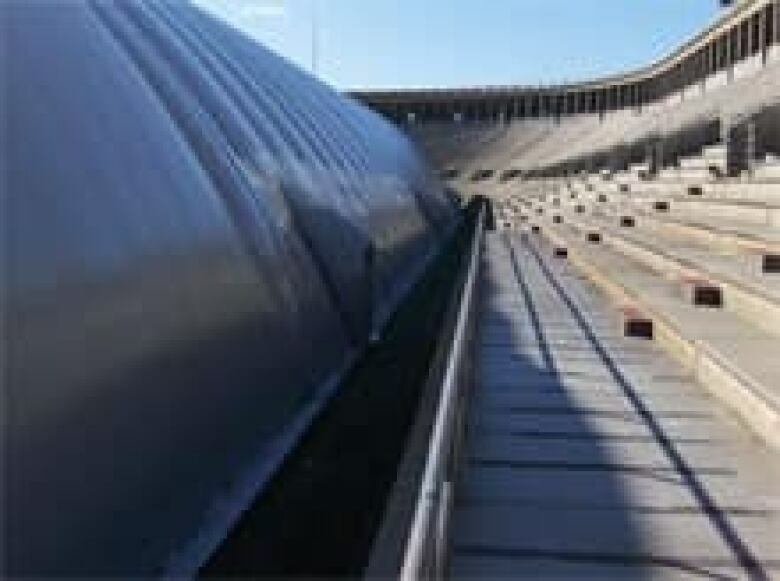 Building the stadium now significantly reduces the long-term cost, creates an immediate stimulus for our economy, and provides a lasting asset for the university and the community." Canad Inns Stadium, built in 1953, would require an estimated $52 million to upgrade. Speculation has been building about fast-tracking the project after Selinger recently revealed the current stadium at Polo Park would need about $52 million in upgrades over the next decade. He had also suggested that putting money into the aging facility might not make sense, like trying to keep an old car going with constant repairs. "It's done," Winnipeg Mayor Sam Katz said about the old stadium at Wednesday's press conference. Canad Inns was built in 1953 and seats 29,533. The new stadium will have 33,000 fixed seats but be able to accommodate 40,000 for major events like the Grey Cup — which will be held in Winnipeg by 2017, Selinger also announced. There will also be 40 private suites and a Hall of Fame for the club. The stadium will be built on an eight-hectare site at Chancellor-Matheson Road and University Crescent on the U of M campus. 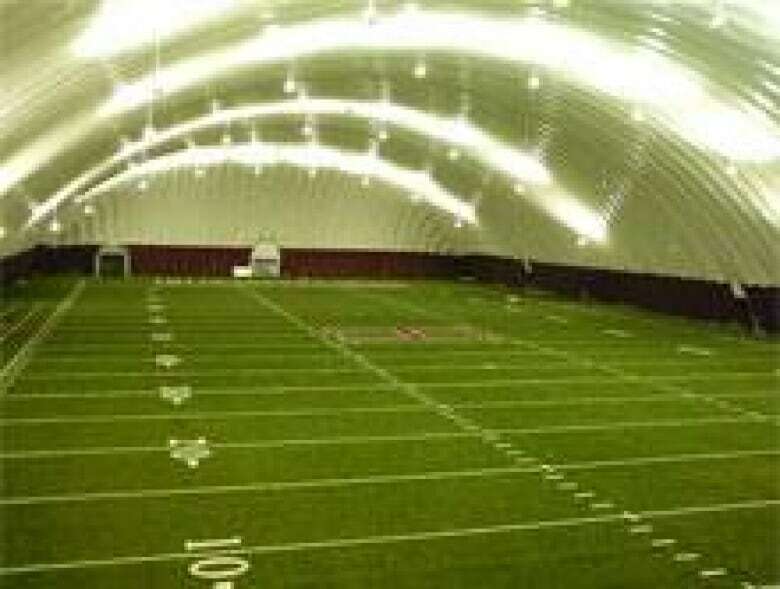 An inflatable dome will cover the field in winter so university teams can use it during the CFL off-season. In addition to the stadium, the site will feature a multiplex athletic facility for the university and its Bison sports teams. It will include a refurbished university stadium and new fitness centre. 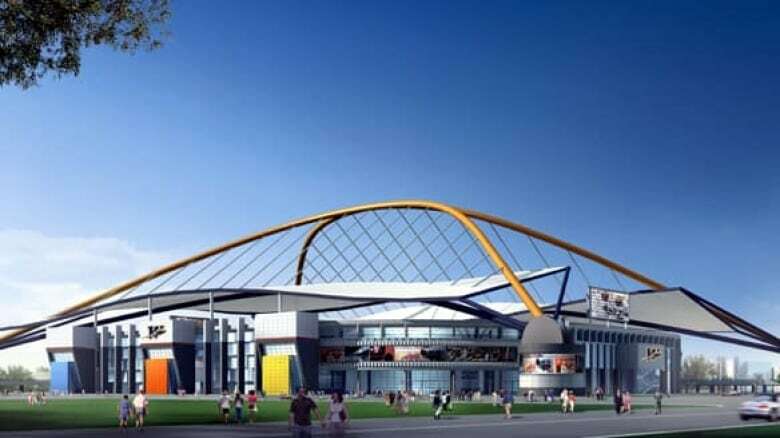 The proposal for the stadium and related facilities was first announced in April 2009 by Winnipeg business magnate David Asper, who agreed to pay $100 million towards the project and take ownership of the team. In return, the federal government pledged $15 million — for the amateur sport component of the facility — and the Manitoba government offered up $20 million. It all hinged on the successful development by Asper's real estate company, Creswin Properties Ltd., of a ritzy retail plaza on the site of Canad Inns Stadium. Once financing was in place for the retail development, dubbed The Elms, the current stadium would come down and the new one would go up. But plodding progress on The Elms was putting the new stadium project in doubt. The original groundbreaking was supposed to happen in February 2010 with a projected opening in summer 2011. Asper was granted a one-year extension on the deal in September after he blamed the bruised economy for impacting his ability to find retailers willing to commit to The Elms. The bridge financing announcement means the stadium development will proceed as soon as possible. Asper has until 2016 to pay off the bridge financing. If he does, he will take ownership of the team, which has been community-owned since it was founded in 1930. A former Blue Bombers board member, Asper has been trying since September 2006 to buy the team. The stadium itself will remain community-owned in perpetuity. If Asper fails to pay off the $90 million, the football club will remain community owned and the loan will be paid back by the province and city, Selinger said. Property taxes generated from The Elms will be used to do that, subject to the council approval, he said. Asper is confident the The Elms development will now pick up speed because potential retailers can be given a more concrete date about when they can move in. "We were in a chicken-and-egg situation," he said. "We couldn't tell them when we were going to take down the stadium because we didn't know when we were going to occupy the new stadium, and therefore we couldn't tell them when they could occupy the stores." With today’s announcement, Bomber and Bison fans are going to get what they have long deserved. The financing commitments the federal and provincial governments originally made to Asper last year remain in place. Of its $20 million grant, which does not have to be paid back, Manitoba is providing $15 million for the stadium and $5 million for the fitness centre, which will be available to students and the general public. The city will also provide $2.5 million for the fitness centre, subject to approval from council. "Our mission from Day 1 has been to create a new stadium that deals directly and completely with making it a place where the fans can enjoy the games with modern and comfortable amenities," Asper said at the press conference. "We’ve never wavered from the goal and I’m happy to say that, with today’s announcement, Bomber and Bison fans are going to get what they have long deserved."